President Muhammadu Buhari has again denied the criticism that he is being selective in his fight against corruption. The President made the rebuttal during a recorded interview session with Thisday Newspaper which was published on Youtube by the media’s sister outlet, AriseTV and monitored by TheNewsGuru.com. In the course of the interview, a question was raised about him[Buhari] being perceived in the public as fighting corruption from a one-sided point of view, but Buhari knocked it off saying it is an unfair allegation on his personal integrity. His said: “It is a very unfair allegation against my integrity, you are in position as a journalist to find out if my son or wife are involved in deals with Customs, bringing in illegal goods etc; I challenge you to investigate and publish it, if you find anything as such. One of the interviewers, Segun Adeniyi told the Buhari that the question was not about the President’s ‘personal integrity’ rather than those of people in his government. Adeniyi cited the case of Godswill Akpabio, stressing that the trend seem to be that once a politician drop the umbrella [PDP] and pick the broom [APC] he/she automatically becomes a saint. Buhari replied with laughter, “Thank you for alerting me, but I can assure you that I do not spear anybody except I don’t have the fact on the case. “I can’t remember anytime I asked the Police, EFCC or any other security operative to clear whatever wrong Akpabio did in PDP before he moved to APC. I have never ordered the security outfits to spear any corrupt person around me or in APC. I challenge you to expose any of such incident if there be. Buhari recalled his days as the Head of State where he was spontaneous in fighting corruption, he, however said the case is different today as he has to follow the laid down democratic processes. 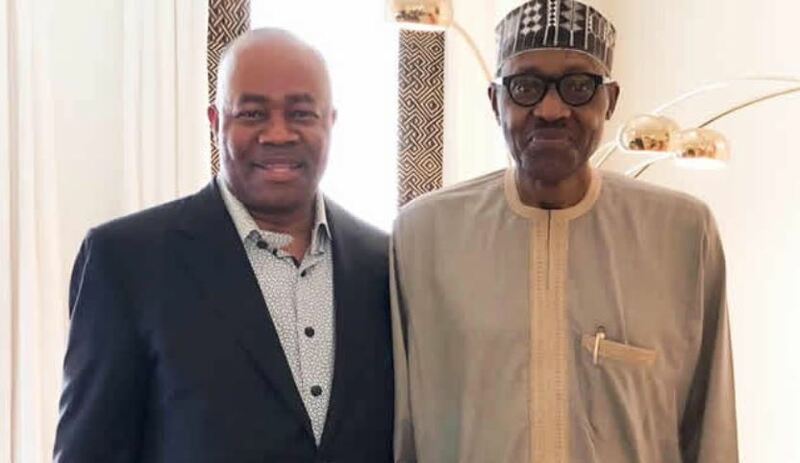 Recall that Senator Godswill Akpabio, had a pending case before the Economic and Financial Crimes Commission following allegations of stealing over N100bn from the coffers of Akwa Ibom State when he was governor, has defected to the ruling All Progressives Congress. The APC-led Federal Government has welcomed him with open arms and political analysts believed the defection could make the former governor to evade corruption trial.